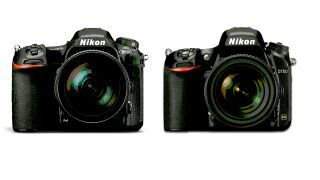 Nikon D500 vs Nikon D750: Which camera should you buy? Unless they’re particularly set on choosing a full-frame camera over one sporting a smaller APS-C sensor, enthusiast and semi pro photographers who favour the Nikon brand may be hard pressed to select a winner between the Nikon D500 and Nikon D750 DSLRs. The D500 has been described as a 'baby Nikon D5', and it suggests itself as a more compact, lighter back up for anyone owning that model, particularly anyone into action and wildlife photography, for reasons we’ll come to later on in this comparison. By contrast, the D750 is what you’ll be considering if you're looking for a full-frame DSLR that nevertheless does without the weight and bulk normally associated with full-frame DSLRs. Both are in the same ballpark in terms of pricing, making a decision more difficult still. Fortunately that is where we come in, offering a side-by-side comparison of both cameras to better inform your choices when buying. Obviously the sensor deployed in each is where these two cameras differ the most. The Nikon D500 incorporates an APS-C sensor, known as the ‘DX format’ in Nikon’s own terms, whereas the D750 sports a full frame – or ‘FX’ format – sensor, its physical dimensions larger than an APS-C chip. Theoretically, a larger chip should provide better image quality – as long as it’s not overburdened by a high pixel count that is. The bigger chip in the D750 is a 24.3MP sensor, a pixel count which puts it just ahead of the 21.51MP chip in the D500. However, it has an older image processor in the EXPEED 4, unsurprising as the D750 was originally launched back in 2014. Nikon stated at the time that this was an all-new sensor, offering wide dynamic range and boasting of a clean, noise-free performance across all ISO sensitivity settings (extendable up to ISO51200 equivalent). Given that it indicates a consumer rather than pro-end camera, the APS-C format 21.51MP sensor on the D500 offers up a comparatively respectable effective resolution of 20.9MP – neither under nor over-burdening the chip in use and therefore helping avoid the appearance of image noise/grain at higher ISO sensitivity settings. In fact, it’s the same resolution as the Nikon D5 offers, albeit on a smaller chip. While most current DSLRs still offer Full HD video at best, the Nikon D500 ups the ante by offering the latest must have of 4K-movie capture. The other capture options are, naturally, Full HD 1920x1080 pixels or HD video at 1280x720 pixels. Actual frame rates vary between 59.94, 50, 29.97, 25 and 23.976fps, depending on the resolution selected – with 29.97fps being the maximum selectable if shooting 4K footage. Sound capture is either via the built-in stereo microphone or via external mic, the latter being a welcome option. As you would expect, ISO sensitivity can be adjusted when shooting video as well as stills, while the tilting rear LCD screen also comes into its own on the D500 when composing and reviewing video. As usual on a DSLR, and so it’s not classed as a video camera for tax purposes, the maximum duration of a continuous recording is 29 minutes and 59 seconds. Where the D750 will fall down in comparison for some is via the fact that it 'only' offers Full HD video capture. That being said, it does also helpfully feature a tilting LCD monitor to aid composition when recording. Full HD clips can be shot at a choice of up to 59.94fps, with accessible light sensitivity when recording ranging from ISO 100 to ISO 51,200. Shutter speed, aperture and audio levels can be controlled too, while a dedicated movie menu means the ability to discover and tweak movie settings in one place. On top of this, Nikon’s Picture Control 2.0 mode allows the likes of contrast, brightness and saturation to be controlled when shooting video as well as stills. Again, there’s the option of utilising the camera’s internal microphone for video recording, or adding an external stereo microphone for more professional results. For video shooters clean HDMI output is offered, and the ability to simultaneously record to the camera’s memory car and an external recorder if wanted. Given that this is a consumer-level DSLR, albeit a premium one, it’s impressive that the D500 offers a continuous frame rate up to 10fps whether utilising manual focus or AF tracking, suggesting it as an excellent candidate for action, sports and wildlife photography. This is for shooting up to 200 frames in JPEG or Raw format at full 20.9MP effective stills resolution, a process lasting 20 seconds. Impressive stuff. Anticipating the need for plenty of storage to cope, Nikon has also blessed the D500 with two card slots – one for the XQD format, the other for SD cards. While the D750 boasts a slightly higher pixel count, its maximum burst shooting speed is 6.5fps – slower than the impressive 10fps speed of the D500, but still very respectable, it has to be said. However, it is clear that if action photography is your bag, for which you might not be considering enlarging images to huge proportions, then the D500 does have a definite edge in this particular category. The Nikon D500 shows its semi-pro mettle as much on paper as in practice, virtue of the fact that it offers a whopping 153-phase detection auto focus points, including 99 cross type sensors and 15 sensors that support f/8, of which 55 (including 35 cross type sensors) are available for selection. This impressive degree of specification helpfully ensures wide and comprehensive cover of the scene, making it ideal for sports and wildlife photographers, while Nikon boasts accurate subject recognition and detail, which we’d pretty much expect at this price. Indeed, the manufacturer says the D500 has the same AF system as the higher-end D5, its flagship FX-format DSLR, and that thanks to a new AF ASIC unit, maximum computing power is allocated to autofocus at all times. Moreover, this DSLR offers AF sensitivity down to -4EV at the central point and -3EV for all other points, suggesting the camera is a good option for low-light work. Nikon describes the AF system of the D750 as phenomenally sensitive, and who are we to argue. It boasts sensitivity down to -3EV and combined with Nikon’s Group Area AF mode, is capable of locking onto a target even in darker conditions. In terms of focus points, this camera offers 51, including 15 cross-type sensors, with 11 sensors that support shooting at f/8. As usual, we also get a built-in AF illuminator lamp, to help the camera automatically, swiftly and accurately determine focus in darker conditions. Most DSLR users will be planning to shoot via the optical viewfinder, with the camera held up to their eye rather than at arm’s length looking at the 3.2-inch LCD screen, and so 100% frame coverage on the Nikon D500 is very welcome. The alternative is to use the rear-plate LCD when in Live View mode for stills or video, which here is helpfully also of the tilting variety. Here we’re given 100% frame coverage via the touch screen monitor, and an eye-poppingly detailed 2,359K-dot resolution. It’s also possible to manually tweak the LCD’s brightness levels. A further advantage of having a touchscreen is that the monitor can also be used to set the AF point, but oddly, settings cannot be selected nor the menu navigated using the screen’s touch control; that’s something that could be improved upon for future generations. The D750 also features a regulation-issue optical viewfinder boasting 100% frame coverage, which is bright enough without being spectacular, plus a tilting 3.2-inch LCD for checking manual focus when shooting stills and for aiding creative compositions when recording video. Though it can’t be swung outward from the body or twisted around to face the subject, as on a camcorder, the screen can tilt upward by 90° and downward by 75°. The resolution is lower than the screen supplied on the D500, but we think a 1.2-million dot resolution is still sufficiently lifelike in terms of detail. A premium-priced consumer DSLR normally means a bulkier, sturdier model than entry-level alternatives at less than a quarter of the price, and the D500 is no exception. With a tough metal chassis fitted with magnesium alloy and carbon-fibre parts, the D500 weighs a solid-feel 860g with battery and XQD memory card, or 760g body-only. In a nutshell, Nikon’s pitches this model as the smaller sibling of the D5. Operating environment is between the standard 0°C and 40°C, with Nikon saying that all joints, buttons and dials are fully weather sealed – again, another indication of its enthusiast level status. Should you want to bulk the camera out further and aid vertical shooting, there’s always the option of adding the MD-D17 battery pack. Controls are, thankfully, clearly laid out, with a ridged mini joystick provided for selecting the AF point quickly while the camera is held up to your eye. The D750 features what Nikon refers to as a ‘monocoque’ (single-bodied) magnesium alloy and carbon-fibre build that is likewise weather sealed and features a Kevlar/carbon fibre composite shutter unit tested to 150,000 uses. The camera weighs 840g with memory card and battery inserted – so only very slightly lighter than the D500 – or 750g with no battery or card. Operating temperature is, once again, the standard 0°C to 40°C. It goes without saying that if you’re looking for a relatively lightweight full-frame DSLR, you’ve found it in the Nikon D750, which has the same degree of weather proofing and robustness as the D810. The Nikon D500 features built-in SnapBridge Bluetooth wireless transfer, while it’s compatible with an optional WT-7A Wi-Fi transmitter. Something else we haven’t mentioned is light sensitivity, with the Nikon D500 offering a core range from ISO 100 to ISO 51,200. This can be extended to the equivalent of ISO 50 at the lowest setting or a whopping ISO 1,640,000 at the highest setting, should that be desired. Bear in mind that the camera’s AF system already boasts the ability to find focus in near darkness (down to -4EV) and you have a capable tool for low-light photography. It’s also worth noting that while the camera is compatible with all Nikon’s DX-format lenses, it can also utilise lenses otherwise meant for full-frame cameras – just with the knock on effect of a 1.5x crop factor. By contrast, the Nikon D750 features a built-in Wi-Fi capability to aid simplicity of image transfer, again an indication of its more pro-orientated full-frame credentials. Digital effects filters can also be applied to both stills and video shooting – those include Selective Colour, Colour Sketch, Miniature Effect and Night Vision. The Nikon D750 also offers two memory-card slots, both supporting the SD card in its various iterations, plus stereo microphones as noted earlier, along with a headphone port. And while the camera offers an enthusiast-enticing level of spec, it offers user friendliness too, via a control layout that doesn’t differ greatly from Nikon’s own D610 and D7200 models. Both the DSLRs being compared here come provide with the same EN-EL15 lithium ion rechargeable battery. The specification for the D500 suggests 1240 shots per charge when using the optical viewfinder for shot composition, which, if that figure is achieved, is excellent. As we’ve noted with the D500, there’s always the chance to add an optional power pack and camera grip combo to eke out more shots from a full charge, if so desired, and perhaps professional photographers viewing this one as a backup camera for their D5 may well take that enticing option. The D750 also utilises the same EN-EL15 battery, but delivers 10 frames less than that claimed by the D500… not that that is a big deal in itself. Alternatively there is the option to capture 55 minutes of Full HD video footage. In any event – and particularly when viewed in isolation – such a performance is still pretty spectacular. There’s the option here too to add an optional battery grip to boost power in the MB-D16, which allows for an additional battery – so two in total – or for six AA batteries to be inserted. Either way, there’s going to be little chance of you running short of juice when shooting with the Nikon D750. While the D750 would seem to be the obvious camera to go for here, as it offers a larger full-frame sensor when compared to the APS-C sized chip of the D500, the camera falls down slightly for videographers in offering Full HD video capture rather than the latest must-have of 4K, a box the D500 ticks. And of course, not every photographer or videographer wants or needs a full frame sensor. There are many areas in which the cameras match each other however – including providing the exact same lithium ion rechargeable battery with not much of a difference in the amount of juice given per charge, plus an articulated rear plate LCD. Obviously, specification aside, the price at which you can find these two cameras will influence your buying decision. As the D750 is an older model, introduced in 2014, there should be good deals to be had, making ownership of a full-frame camera more affordable than ever. If you can live with the physically smaller APS-C sensor, the 10fps continuous capture performance makes it the obvious winner for action, sports and wildlife photographers, for which speed and accuracy is more important than being able to blow the images up huge. It also offers existing Nikon enthusiasts a capable camera they can upgrade to without necessitating a jump to full-frame photography, if that is neither warranted nor desired. However, if it’s full-frame photography you do lust after, then you should find that the D750 offers excellent value for money for the price.